A new form of biodegradable plastic capable of degrading under home-composting conditions has been developed by Irish based scientists. The material could prove an important development in the struggle to rid the environment of polluting single use plastics. Less than 15% of the world's plastic is recycled, with much of it ending up in rivers, seas and oceans, landfill or the general environment as litter. It is estimated that over 80% of Irish coastal areas and inland waterways are polluted with discarded plastic. Scientists at the BEACON bioeconomy research centre and AMBER materials science research centre have, however, designed a new biodegradable material which could help alleviate the problem. In research, details of which are published in the journal Environmental Science & Technology, the team led by BEACON Professor Kevin O'Connor and AMBER scientist Dr Ramesh Babu, 15 biodegradable plastics and mixtures were studied. They discovered that by blending two different varieties it was possible to make a plastic that would break down completely under home-composting conditions. They found that by adding polycaprolactone (PCL) to polylactic acid (PLA), which normally on its own requires high temperatures to disintegrate, the material completely broke down in an environment mirroring a home composter. 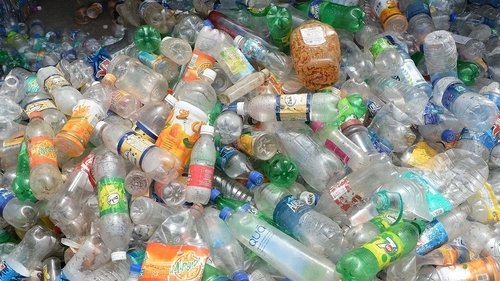 "Imagine putting your waste plastic packaging into a household composting bin that breaks down the plastic and produces compost for your garden or into your brown bin so waste collection companies are able to mix plastic with unavoidable food waste and produce biogas to run their fleet or power your home," said Professor O'Connor. "That's the future this study suggests." The new plastic is just as robust as existing versions, the scientists say. "We have shown for the first time that you can blend plastics together to make them more biodegradable but still keeping the strength and performance of the plastic," said Dr Babu. "This opens up huge opportunities to create novel sustainable plastics that perform in multiple positive ways for society."